Who would have thought an alligator would sell that fast???? So this afternoon, I did what I usually do after seeing Gene off to work – I sat down with a nice cup of herbal tea and perused craigslist. Imagine my delight and amazement when I saw somebody selling a 16″ alligator! A real one, they had a photo and everything, with the caption “Not a Cayman!” (Like I would know, or care; either way it looked badass.) In my haste to text Gene and ask if I could spend $200, I almost knocked over my tea. Sadly, by the time no less than three people had refused to give me two Benjies (thanks for nothing, Gene, Bess Bess, and Abigail), the alligator sold. Or the listing got yanked off craigslist, since I’m 99 percent certain it’s illegal to own or sell one without a whole pile of permits, which I’m guessing random craigslist guy didn’t have. But anyway, my point is, immediately write down the contact phone number for people whose ads are so sketchy they don’t stand a chance. Opportunity like that doesn’t knock often, and when it does, it doesn’t wait around for you to open the door. Since I won’t be photographing alligators cavorting in my backyard anytime soon, I settled for pointing the camera at Luigi who decided to make a rare appearance just in time to cheer me up. He was swinging gleefully from the filter, taking random snaps at passing shark tails. 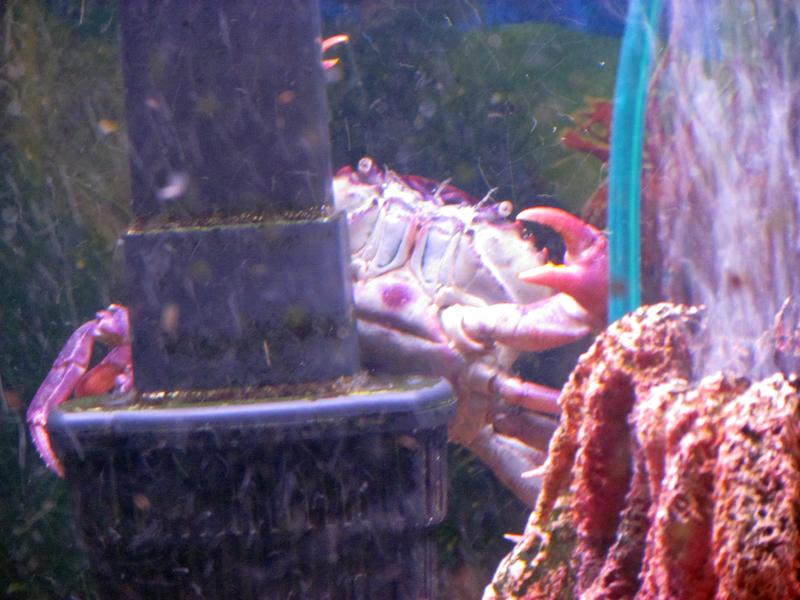 It shouldn’t be possible for crabs to smile, but tell me that doesn’t look like the world’s most mischievous crustacean.